Today I made a Magnolia card using Waterlily Tilda because I am thinking positive, Summer is almost here!?? lol Really, I made it for my DT at 7 Kids College Fund as we have a new challenge that begins today. I hope you get a chance to join us but please use a item available at the store. I linked the store so you can look at see what they have. 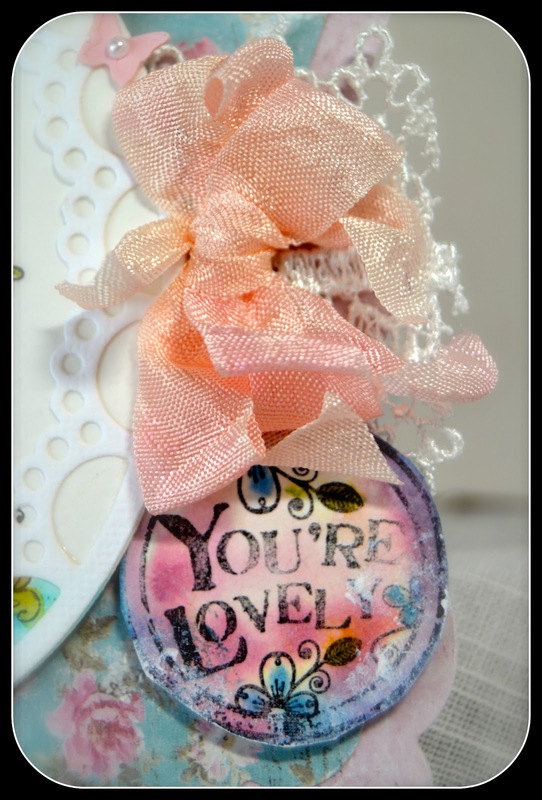 I used a Go Kreate die for my card base and the lovely Maja design papers. I framed Waterlily Tilda with a die cut from Marianne Craftables Passe Partout Oval die. I used this pretty sentiment from Lili of the Valley and colored it in Distressed Inks as well. 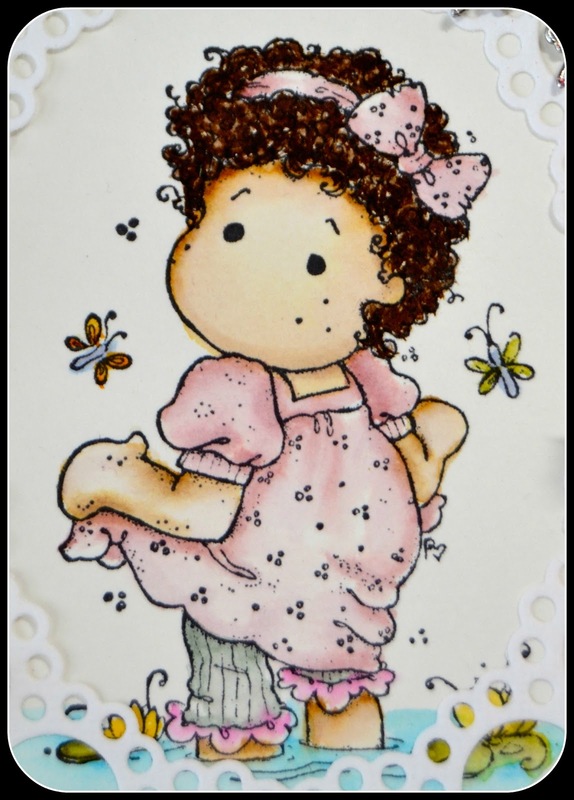 I hope you enjoyed my card today and also join our new challenge at 7 Kids Challenge Blog to win the $20.00 gift certificate to the 7 Kids College Fund Store. Oh so lovely, just beautiful ! Héhé we used the same paper today lol ! She is absolutely gorgeous and I love all the fabulous embellishments. I adore that oval die cut framing Tilda. I really like what you did with the sentiment..so pretty! You can never go wrong with Maja papers! What a beauty! Love the shaped card and your coloring is marvelous! Of course the Maja papers are divine. 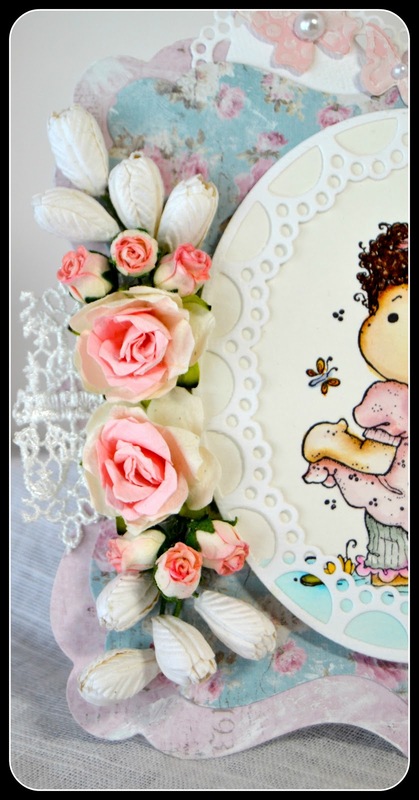 Your flowers and embellishments are awesome too! I shoveled snow this morning and the weatherman is calling for 50+ tomorrow. Does that mean Spring?? Don't cha just love these pretty spring colors! I know you do - all you see is white!! I do love the shape of your card and it is so dainty looking - a real girly girl card! Bravo! Okay kid - what did you all buy!!!!!!!!!!!!!!! Just hold the card and breathe it in! I haven't given up hope. We traded in the snow from 2 days ago for hail today. Second thought, I'm gonna smush my face against the monitor and breathe it in myself!!!! She's GORGEOUS and ALL of your embellishments are perfection. LOOVE that bubbled frame around her too. Crossing fingers for you Kelly! Your card is stunning! Such beautiful coloring and love all your details. You best keep in touch. Going to miss you. woooow this card is gorgeous!!! so soft and dreamy!! So, so pretty, and perfect spring colours!